Thanks to a wide array of pioneering and collaborative efforts, significant volumes of abandoned fishing nets have been given a second life, while at the same time plastic waste in our oceans has been reduced. According to a report jointly produced by FAO and UNEP, fishing nets abandoned at sea remain in the marine ecosystem for hundreds of years, and can result in the accidental capture of dolphins, turtles and other marine animals, which can die trapped in the mesh. Known as ghost fishing nets, experts have estimated that there are roughly 640 000 tonnes of these nets currently in our ocean, accounting for 10 percent of the total plastic waste in the sea. A variety of efforts aim to tackle this issue through recycling nets and turning them into something that has the potential to be profitable. One such effort is "Healthy Seas, a Journey from Waste to Wear" and was launched by Healthy Seas Initiative to recover nets from the sea bottom with the assistance of volunteer divers. The nets are stored in special facilities and once cleaned from other materials, are regenerated into a high-quality nylon yarn called Econyl. Econyl can be used to create new products such as socks, swimwear and carpets. Recently, two leading Italian fabric companies have joined the initiative, adding themselves to a long list of partners, which also includes the European Commission. Other similar efforts have emerged worldwide. For instance, the Net-Works initiative recycles discarded fishing nets in Danajon Bank, the Philippines. In 2014, this initiative received the European Business Award for the Environment from the European Commission. Laure Rondeau, Co-Founder of Net-Works stated, "Since its launch in 2013, the programme has established a very successful community-based supply chain for collecting discarded fishing nets in rural coastal areas in the central Philippines - collecting 41 tonnes of fishing nets and benefitting 4 500 people". The success in the Philippines has led to the launch of a second similar project in The Lake Ossa region of Cameroon, where abandoned fishing nets are being recycled into carpets. In South America, a project called Bureo began in 2012 (meaning "wave" in Mapudungun, the language of the Mapuche, an indigenous people of Chile), and turns abandoned fishing nets into skateboards and sunglasses, keeping track of each tonne of net recycled. 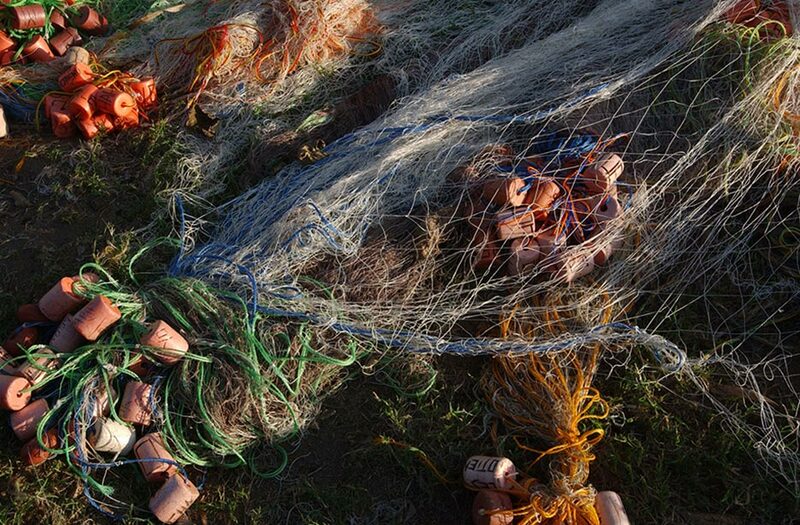 Thanks to the support of the Chilean government, Bureo also launched the "Net Positive" program in 2013 for the collection and recycling of fishing nets, focusing on raising fisher's awareness of the issue. Bureo purchases every pound of received ghost nets from the fishing community for an agreed amount, which is then used to fund educational and recycling activities. Abandoned nets could also be a potential resource to further develop economic opportunities. This is the idea behind the Australian project Ghostnets, a community based project putting together fish workers and indigenous community in a joint collaboration to tackle ocean pollution. Nets are collected by indigenous communities and transformed into crafts and accessories. Profit from the sales becomes a partial income for all community members involved and thus supports local economic development. In a similar vein, a well-known sportswear brand recently launched a partnership with Parley For The Oceans, an environmental organization, with the idea to create running shoes made from recycled ocean plastic. The idea to transform ocean waste into highly useable, recycled products is gaining traction through these efforts around the world. Aiming to reduce environmental waste while bolstering economic and social sustainability is in line with FAO's Blue Growth Initiative, which seeks to strengthen livelihood opportunities while achieving more efficient and sustainable use of resources.